The subacromial area lies between the top of the arm bone (Humerus) and a bony prominence on the shoulder blade (acromion). 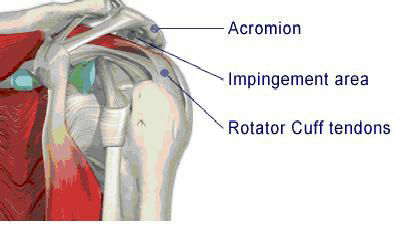 A fluid filled cushion (bursa) lies between rotator cuff tendon and the acromion. With certain positions the bursa and the tendon can become pinched and inflamed. The pain that you have been experiencing is caused by this pinching and is typically felt on movements such as reaching and putting your arm into a jacket sleeve. Treatment can involve injection therapy, physiotherapy, and surgery. Surgery is done if patients do not respond to nonoperative measures and is called arthroscopic subacromial decompression. The operation is done by ‘key hole surgery’; usually through two or three 5mm puncture wounds. It involves cutting the ligament and shaving away part of the acromion bone. 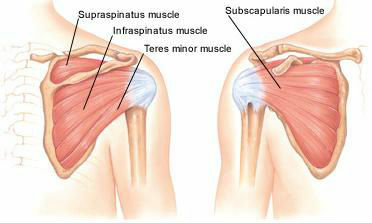 This increases the size of the subacromial area and reduces the pressure on the muscle and bursa allowing them to heal. The operation is done by key hole surgery; usually through two or three 5mm puncture wounds. It involves examination of the shoulder joint using a tiny telescope with television camera introduced through a key hole. The rotator cuff consists of four muscles and their tendons. These surround the ball of the shoulder joint. The muscles fine tune the movements of the shoulder joint and assist other large muscles in moving the arm. The tendons run under the acromion (part of the shoulder blade) where they are very vulnerable to being damaged. 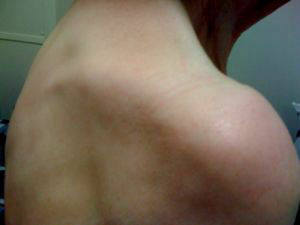 This can lead to a tear resulting in a painful, weak shoulder. A tear may result suddenly from a single traumatic event or develop gradually as part of a degenerative process. Treatments would involve typically injections into the shoulder, physiotherapy and if these fail surgery. A repair involves stitching the torn tendon back onto its attachment to the arm bone (Humerus). It can be performed through keyhole surgery.